Oodles of Opportunities for the Academic 2018-2019 year! 1. The textbook itself contains numerous hands-on activities. These are found primarily at the back of each chapter. They tend to be short and sweet and you will find hundreds throughout the textbook. For some examples, sign up for our activities newsletter. 2. We have embedded the popular PhET simulations from the University of Colorado into each of our courses. A PhET simulation allows the student to play with the parameters of a system (virtually) and to follow the results. Below is an example. We encourage you to play with the “Phase Changes” segment of this one simulation. Be careful because too many molecules and too much heat and pressure will cause the chamber to explode (virtually). 🙂 We also include worksheets that guide a student through select simulations. 3. We now offer the “Beyond the Lab Manual” for physics by Stephanie Blake as well as for chemistry by Brandon Burnett and John Suchocki. These creative manuals feature many engaging and mind-opening, hands-on experiments utilizing only readily available materials. 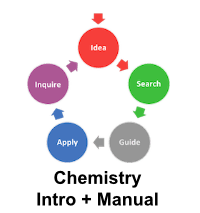 For each activity, after following through a prescribed set of instructions (guided learning), the student is then pushed to create their own experimental procedure on a related subject (inquiry learning). Kitchen-tested and class-tested, these manuals are available for free download on this web page with a requested contribution to support the development of similar manuals in our other fields. In case you decide not to download either of these complete manuals, you should know that a few select labs from these manuals have already been embedded into the FYI pages of our courses. Here’s a link to a sample “Beyond the Lab” activity (Filesize: 5 MB): BottleDrop. You’ll need to download this file for the embedded videos to work. 4. Each of our textbooks comes with a dedicated lab manual containing hundreds of lab activities, which is way too much for any single self-study course. So, in conjunction with the above mentioned activities, we have narrowed this down to about two dozen labs that we have cut and pasted into documents made available to you through the FYI pages of each course. Complete with answer keys. 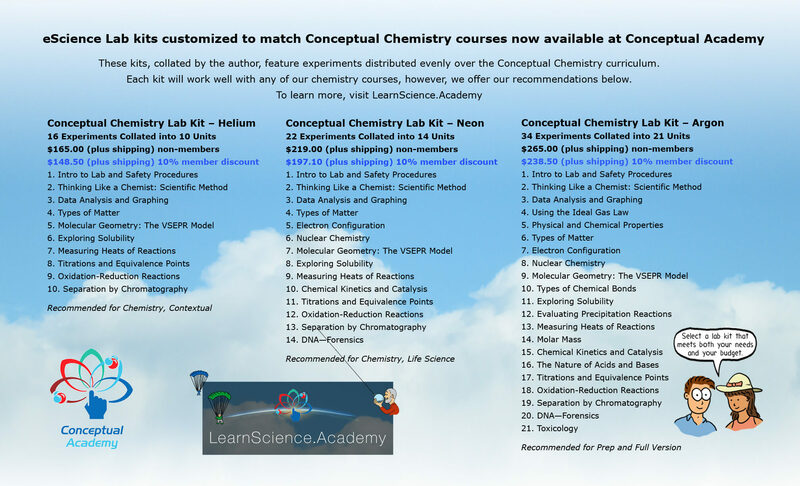 For our chemistry courses, in addition to the above resources, we also still recommend our custom designed lab kits available from eScience Labs. These kits work well for students seeking a more traditional laboratory experience, or for situations where you have multiple students within the same course. You’ll find one kit can be shared among several students. 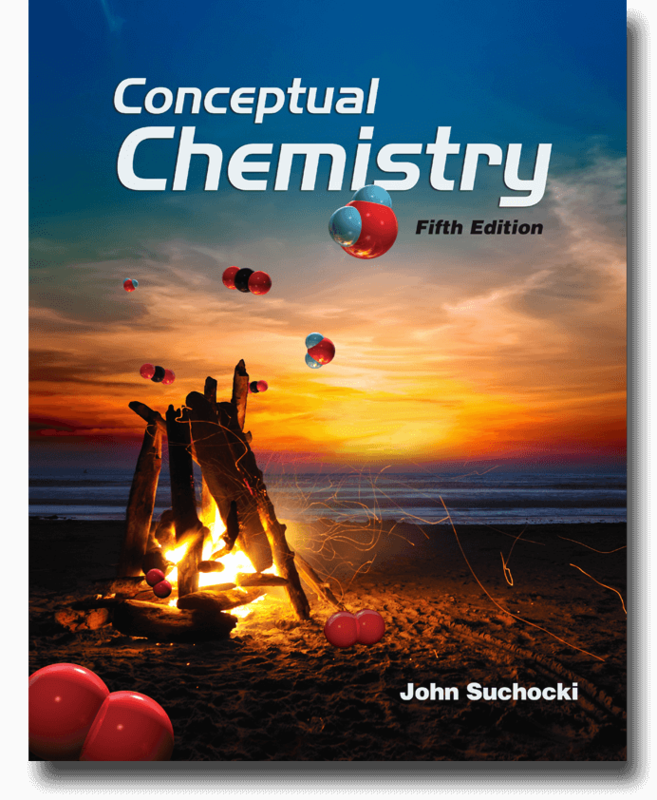 Please see the users manual for each chemistry course to learn more about your options. Below is the detailed information you’ll need to move forward with one of these chemistry kits. Thank you for joining us at Conceptual Academy. We look forward to working with you and providing a world-class science education for your students. For home schools looking for this added resource, John has been working with the folks at eScience Labs to develop chemistry lab kits customized to his Conceptual Chemistry curriculum. The goal was to create a kit that would offer exciting hands-on experiences with key chemistry concepts for a reasonable price. Like a kid in a candy store, he picked his favorite 34 experiments, collated into 21 units. The price tag was pretty much up there. So, he tried again, painfully removing activities to come up with a healthy 22 experiments (14 units). This looked like a sweet spot. But to bring even more affordability, he narrowed it down to the most essential 16 experiments (10 units). Then he thought: Why not offer all three kits to home schools using his curriculum? The folks at eScience Labs have also graciously provided a special 10% discount to visitors of LearnScience.Academy. Thus was born our Conceptual Chemistry/eScience Lab Kits with a special 10% discount for any LearnScience.Academy visitor. Not to lose out on a teaching opportunity, John named these kits: Helium, Neon, and Argon. Helium, of course, is the lightest noble gas. Neon is the brightest (when electrified). Argon is the most abundant—indeed, our atmosphere is about 1% argon, which is much more abundant than either neon or helium (which tend to float upward into outer space). You’ll clearly want more information about them. To start, click on the following image to see it as a high resolution .pdf file. Scroll down further and you’ll see a link for a .pdf collating the full suite of labs (Argon) to the Conceptual Chemistry chapters. And, of course, be sure to explore the eScience Labs website for more information and samples. All the labs within this manual are designed to be safely performed using only materials from your household or a local discount store. Thank you for being responsible in following common sense safety precautions and procedures. Developing this lab curriculum is a time and energy intensive endeavor. Any support you are able to provide helps us, and Stephanie in particular, to develop this curriculum further. Following the PayPal Donate button shown below will securely allow you to contribute a suggested $15 per family. Thank you! All the labs within this manual are designed to be safely performed using only materials from your household or a local discount store. Thank you for being responsible in following common sense safety precautions and procedures. Developing this lab curriculum is a time and energy intensive endeavor. Any support you are able to provide helps us, and Brandon in particular, to develop this curriculum further. Following the PayPal Donate button shown below will securely allow you to contribute a suggested $15 per family. Thank you!